We strongly believe in the development of long-term relationships with our customers, who in turn can be assured of receiving a reliable, progressive logistic solution and a high quality professional service alongside dedicated and efficient management of their transport requirement. 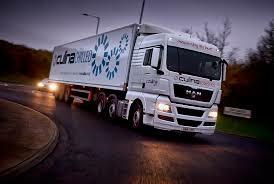 We operate road haulage services around the UK. We are able to tailor services to match the requirements of each individual customer. Every customer has different requirements and priorities, and therefore it is our role to meet these criteria with its diverse fleet of vehicles and logistic solutions.